Carbon dioxide is commonly used as an industrial liquid refrigerant but could also be effective in heating and cooling buildings in urban areas. A prototype developed by EPFL researchers shows the feasibility of this concept. CO2 is known to be the primary greenhouse gas, but it could also help slow global warming. Commonly used as a ‘clean’ liquid refrigerant in supermarkets, carbon dioxide turns out to be an efficient vehicle for transporting the energy needed to heat and cool buildings, particularly in urban settings. EPFL researchers have demonstrated that a heating and cooling distribution network using CO2 could lead to over 80% in final energy savings. Their work is backed by a prototype and simulation run in the commercial district of Geneva. In Europe, the building sector accounts for 40% of final energy consumption and around one third of greenhouse gas emissions. Switzerland is no exception. And in cities like Geneva and Lausanne, there are many types of buildings with diverse heating and cooling needs. For example, to achieve a comfortable level of heating, the temperature of water circulating through an old radiator must be at least 50 degrees Celsius, while floor heating only requires a temperature of 30 degrees. And in the summer, supermarket air conditioners run at full blast – giving off heat at the same time – while just steps away a gas boiler heats the water that is piped to all the floors of the building. A real waste of energy. Samuel Henchoz, who is part of the Industrial Process and Energy Systems Engineering Group, teamed up with the Energy Center to address this problem. In his thesis, Henchoz analyzes a new concept based on a saturated liquid refrigerant – in this case pressurized CO2 – circulating between buildings. Just like in a refrigerator, liquid CO2 evaporates in a heat exchanger in order to provide cooling. To produce heat, it does the opposite: CO2 gas releases heat in the heat exchanger. In Henchoz’s system, CO2 circulates at a temperature of around 15 degrees, close to its saturation point between the liquid and gaseous states. This is also close to the temperature of soil underground, which limits the need to insulate the pipes. Because there is no risk of freezing, the pipes could even be installed under sidewalks. The pipes themselves could be much smaller in diameter than pipes in a water-based network since the gas is pressurized and has a high energy density. Another notable advantage is the fact that the liquid refrigerant recovers the heat given off by coolers along its path, reducing the amount of heat needed from district heating plants. The concept is certainly appealing on paper. But would using CO2 as a liquid refrigerant in urban areas be safe, reliable, efficient and economical? 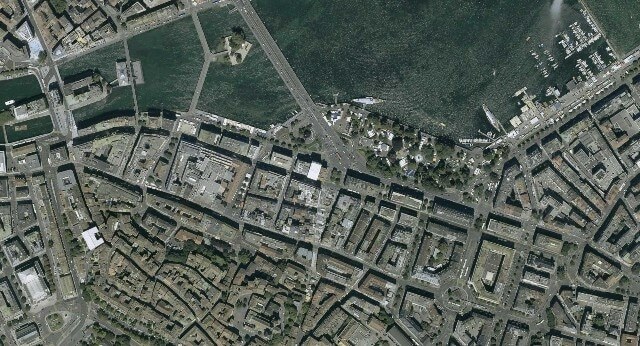 Henchoz set out to determine this by analyzing a neighborhood in the center of Geneva. He compared the energy performance and economic profitability of five variants of fluid refrigerant networks, a cold-water network and the mix of energy conversion systems that is currently in use. Thanks to financing from the Commission for Technology and Innovation (CTI), Henchoz created and tested a small-scale liquid refrigerant network in collaboration with Geneva's utility company and the engineering firm Amstein+Walthert. The tests were aimed mainly at demonstrating the concept’s feasibility. The system did indeed perform as expected, at the same time validating the concept of automatic control. “The tests boosted our confidence in the practical aspects of a CO2 network,” said Henchoz.